Discussion in '3D Printer Models / Reviews / Experiences' started by Nifty, Sep 14, 2018. 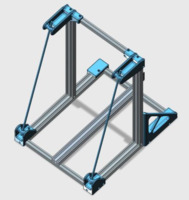 I haven't had any problems, that I know of, printing tall prints (but don't print many), but see all these brackets / solutions to making the frame more ridged. I stumbled on this thing and thought about printing the triangle part of it for a quick / easy additional support. Then I started to wonder "is it worth printing this or should I just drill some holes in a metal shelf bracket and use that? So, will adding a bracket (the triangle pice) make much difference, and if so, should I print this one or make one out of metal? Yeah, I'm not sure it would make much of a difference, and I don't print very tall prints anyway. I'm very much not inclined to add the huge rods / brackets, but thought the one bracket that is out-of-the-way might not hurt... but now I'm even debating if that's worth it. It can actually make things worse on some machines as the frame vibrations can add to the already resonating standard frame.